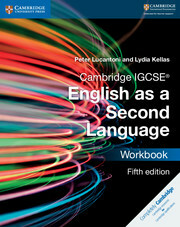 This Cambridge Elevate enhanced edition supports students studying for Cambridge International Examinations IGCSE® English as a Second Language syllabuses (0510/0511/0991), for first examination in 2019. The resource has a language focus in each unit and provides new ‘Word Tips’ and ‘Top Tips’. Themed units take an integrated skills approach while emphasising a core skill – reading, writing, speaking and listening. This resource contains embedded video and audio in every unit that supports students with speaking and listening. Interactive activities cover the core skills, helping students to consolidate learning and self-assess progress. 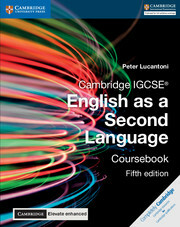 Answers to coursebook questions are in the teacher's book. Cambridge Elevate editions are customisable and interactive, allowing students and teachers to annotate text, add audio notes and link to external resources. More speaking and listening practice added with new units that focus on speaking. 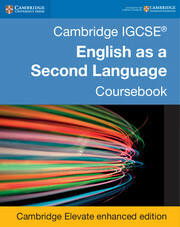 Exam-style questions in each unit and 'Top Tips' help learners prepare for the Cambridge IGCSE® English as a Second Language examination. 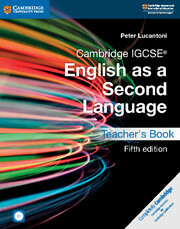 A language focus in every unit with 'Language Tips' draws attention to common learner error. Interactive practice activities deliver comprehensive coverage of the four core skills – reading, writing, speaking and listening. These help students to reinforce course learning and consolidate knowledge. 'Word Tip' features help develop students’ vocabulary. Each unit closes with a 'Reflection' section where learners are encouraged to reflect on their learning and take responsibility for personal goal setting.